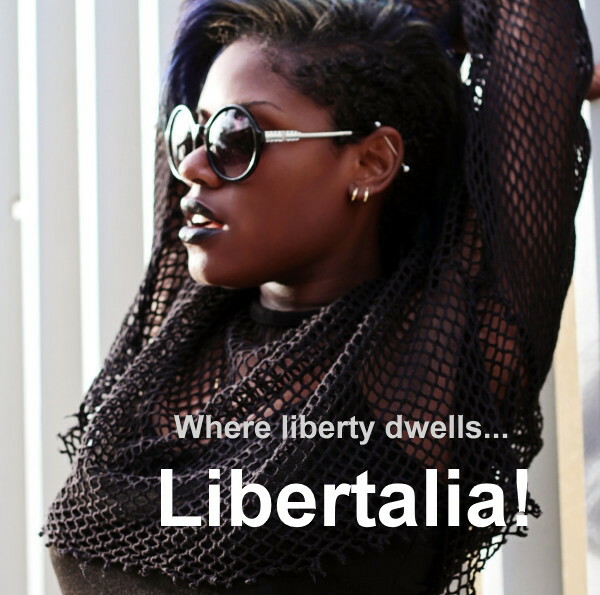 Libertalia | It’s not just a band. It’s a nation. “In this crazy, mixed-up world where the alleged Land of the Free has the highest incarceration rate of any country, the inhabitants of Prison Planet cry out for some small corner of the earth where health, wealth and happiness might be pursued unburdened by the Dictates of Oligarchs or the Tyranny of the Masses. Most original bands, content to merely find an audience for their material, would be ecstatic to launch an artistic movement. Libertalia seeks to go way beyond that. Their objective is to give musical voice to a movement to create an entirely new nation-state. They’re not looking for fans. They’re looking for freedom fighters. Have they completely lost their minds? Maybe. Maybe not. Not unlike Steely Dan, which at its peak consisted of keyboardist/vocalist/writer Donald Fagen, guitarist/bassist/writer Walter Becker and whatever sidemen the duo considered the best fit for recording each individual track or performing the body of material live, Libertalia is essentially vocalist/dancer/actress/fashion designer Joni Margaux, guitarist/bassist/vocalist/writer/arranger/producer Randell Young and whoever else they use (either live or in the studio) to pull off their aggressive and challenging material. Randell Young began his professional career right out of high school playing R&B clubs in his hometown of Washington, D.C. Nearly three decades later, Joni Margaux began her professional career at age 11 cast as The Young Nala in the Walt Disney Company’s production of The Lion King at the Pantages Theater in Los Angeles. Soon after her year-and-a-half run ended at The Pantages, Joni Margaux met Randell Young at the Henry Fonda Theater in Los Angeles during an audition for an ambitious children’s entertainment project called Zarbie and The Martians. Joni’s version is that Randell had already been hired to write and record the soundtrack and that he insisted Joni be cast as Zarbie. Randell’s recollection is that Joni had already been cast in the lead and lobbied hard for the executive producers to bring in Randell. The discrepancy speaks volumes about the duo. They are both quick to recognize their collaborators’ contributions and give away credit wherever possible. Despite the difference in their ages, the two future Libertalians became great friends working on the Zarbie project as they soon discovered they shared not only the same birthday (13 January) but the same philosophy, i.e., the art comes first and cannot be compromised. If the project generates financial rewards, great, but the focus is always on the music, period, not the money, the individual accolades or opportunity for career advancement. The two always assumed they would work together again at some point but it was nearly a decade after Zarbie that they actually teamed up in the studio. In the interim, Joni would complete a bachelor’s degree in World Dance at UCLA and travel to Europe and Argentina to both study and perform while Randell would, among other things, be signed by Artie Mogull to produce Bob Dylan Revisited, a tribute to the prolific songwriter set to feature vocal performances by numerous stars originally discovered by Mogull, the former Chairman and CEO of United Artists Records renowned as being second only to Clive Davis in terms of the number of careers launched in the popular music business. It’s no secret that Friedman and Thiel share a philosophy that in years past would have earned them the political label of “liberal”. Today, they might be called “classical liberals” or “libertarians”. While they are open to any sort of experimentation in governance mutually agreed upon by the governed, Friedman and Thiel, no doubt, envision a floating state where residents enjoy a minimum of interference from collectivist power brokers in their both their personal and business lives. Friedman and Thiel, Margaux and Young are among those who believe that liberty has yielded so far and collectivism gained so much ground that political activism – in any given country – may not be enough, that what is actually needed is a fresh start… somewhere, whether on a floating city or an island such as the (perhaps) mythical Libertalia. A band lending its music to a cause is certainly nothing new but the founding of a new nation-state? Is that even possible? From a musical perspective, it would seem that Libertalia is a perfect fit for, well, Libertalia. The group creates modern American dance music with significant elements of Jazz, Rock, Reggae and WorldBeat. It’s a style of music that combines energy with sophistication, an international frame of reference and a substantial knowledge of music theory and history. And it’s real. In an era where almost every vocal track you hear in the popular culture has been run through Auto-Tune, all Libertalian performances (instrumental and vocal) are recorded live to hard drive using modern multi-track technology but without pitch correcting devices (hardware or software), quantizers, sequencers, samplers or drum machines. What? Singers that can actually sing? Musicians that can actually play? Now there is one hell of a concept! Lyrically, they don’t come with anything as direct (or as militant) as “La Marseillaise” or, for that matter, “The Star Spangled Banner” but they do interject classically liberal themes throughout and, at least metaphorically and atmospherically, the philosophy of new age libertarians such as Jane Roberts, Ayn Rand and Dambisa Moyo. “To him that hath shall be given blessings falling like the rain. 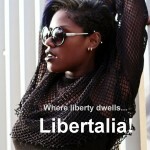 Libertalia also brings something extremely rare in modern pop music, a subtle sense of humor. Whether it’s the spoken voice of God declaring in the last verse of “That Thing You Do” that “There is a day!”; the conclusion of each chorus of “The Dance of Lil-Lea” with a massive chant of “Om”; or the ending riff of “Time Out!”, obviously lifted from Wagner’s “Flight of the Valkyries”, it’s clear that Libertalia has a level of professional competence that enables it to make serious music while not taking itself too seriously. But can this music actually be used to help unite market-liberals from all around the world behind the objective of creating, somewhere on the planet, at least one truly free country? It would seem to be an utterly improbable, if not outright impossible, objective. And yet Margaux and Young go about their business with the quiet confidence of those who have seen their future and are simply rising up to meet it, enjoying their journey as they discover how the Universe intends to unfold its mystery. “I am not the one to save you and I know that you know why. I can only plant direction. Look me right in the eye. I say you’ve known all the answers since the edge of time. You can also access their SoundCloud tracks using the Radio Libertalia link at… RandellYoung.com which is a lot easier to remember. And if success is a journey and not a destination, the dream of creating some “small corner of the globe where health, wealth and happiness might be pursued unburdened by the dictates of oligarchs or the tyranny of the masses” will not only be alive but, on some mystical metaphysical plane: genuine, authentic and existent. Pingback: Radio Libertalia - Libertalia!